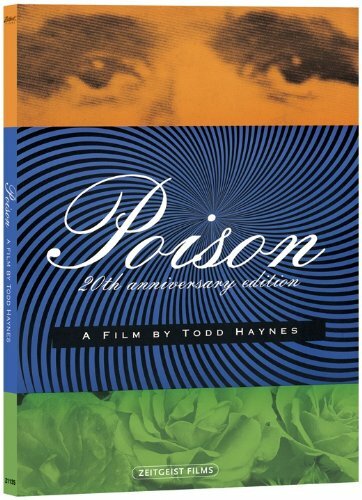 New York (May 4, 2011) — Two decades after its original groundbreaking release, Zeitgeist Films is proud to present a remastered 20th Anniversary Edition of Todd Haynesʼ Poison . From the Oscar®-nominated director of Far from Heaven, Iʼm Not There and the HBO mini-series Mildred Pierce, this controversial masterpiece is the most fervently debated film of the 1990s and an iconic work of New Queer Cinema. Winner of the 1991 Sundance Film Festival Grand Jury Prize, Haynesʼ first feature (his follow-up to the underground short sensation Superstar: The Karen Carpenter Story) is a trailblazing American indie and a thrilling work of immense visual invention. Following a 2010 theatrical re-release, Zeitgeistʼs new edition of Poison comes to DVD on June 21, 2011. The disc features a new HD transfer created from original film elements and enhanced for widescreen viewing. Extras include: 20th Anniversary Sundance Q&A with Todd Haynes, producer Christine Vachon and executive producer James Schamus; archival 1999 audio commentary by Haynes, Vachon, and late star/editor James Lyons; original poster concepts and collages by Haynes; rare on-set polaroids by filmmaker Kelly Reichardt (acclaimed director of Meekʼs Cutoff and Wendy and Lucy); Last Address, an elegiac short film by Ira Sachs (award-winning director of Married Life); the original 1991 U.S. theatrical trailer; and English subtitles for the deaf and hearing impaired (SDH). Also featuring collectible digipak packaging and 16-page booklet with archival press documents, J. Hobermanʼs original Village Voice review and more, Zeitgeistʼs new edition of Poison is available in the U.S. and Canada only with an SRP of $29.95. CRITICAL ACCLAIM FOR TODD HAYNESʼ "POISON"